My second Whole30 has come and gone, and I am simply amazed at what a different experience it was compared to my first one (four years ago when I was pregnant with Finch). I actually did 31 days this time! You can read why I did another round here. I followed all the strict ingredient rules of the program, but something I did different this time was to ignore the recommendation against purchasing prepackaged snacks with compliant ingredients. Why? I’ve done the Whole30 before, and after 30 days I basically went right back to my old way of eating. This time, I wanted to make it more of a lifestyle change and find healthier replacements for things I eat on a regular basis. 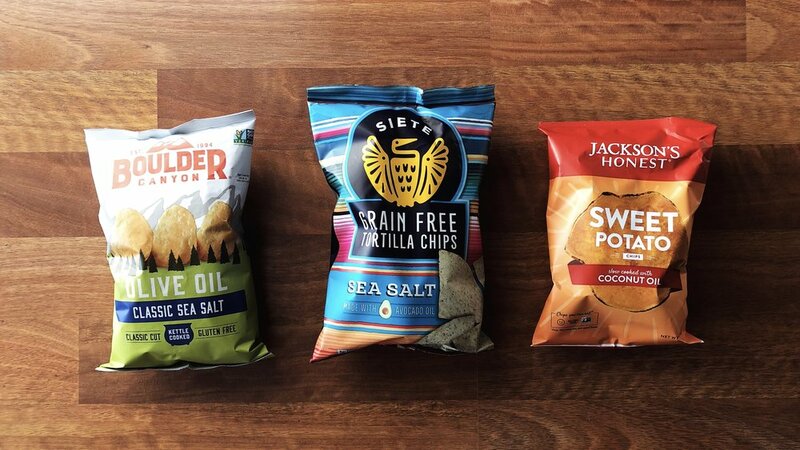 For instance, I love sweet potato chips but haven’t been happy with those I’ve made at home (not to mention all the time that goes into it), so when I found a bag of sweet potato chips with Whole30 compliant ingredients, I was all over it (and they are deliciously crunchy). Siete grain-free tortilla chips (ingredients: cassava flour, avocado oil, coconut flour, ground chia seeds, sea salt) — so yummy with guacamole (recipe below)! I also had a smoothie one night just to mix things up (and get some spinach in my diet), and I tried a few different LARABARs, RXBARs and fruit leathers/bites (again, only those made with compliant ingredients). So while I didn’t complete a “perfect” Whole30, I feel empowered to continue to make healthy choices now that it’s over. So I say go buy that Cauliflower Gnocchi from Trader Joe’s and have no guilt! The Whole30 is a wonderful “reset” — find ways to make it work for you! I have been 16/8 intermittent fasting for five months (I eat from 11:00 am to 7:00 pm each day), and I mostly kept that up through the Whole30. I always ate when I was hungry, but it definitely made the entire program easier because I only had to figure out 60 meals instead of 90. I highly recommend IF if you are wanting to make an easy change! There are so many benefits. Wanted to share a few of my favorite recipes and foods that we will definitely keep in regular rotation! IT’S OVER … NOW WHAT? Well, first, we are going to South Carolina in a few days, so I’m going to enjoy that! And then…I’m not 100% sure. I’m actually a little apprehensive that it’s over because it is such a cut-and-dried way to make good choices. I really don’t miss sugar that much! I missed pizza the most, and the ease of eating out in social situations. One benefit of the Whole30 is that it really helps you decide what’s “worth it” to you (buttered popcorn at the movie theater is definitely worth it to me). I would love to stick to Whole30 Monday through Thursday and allow myself Fridays and weekends to be more lenient, but I also love the energy I have right now and don’t want that to disappear! And I still feel like I have more weight to lose, so after our trip I definitely want to return to my Whole30 habits. Have you done the Whole30? I would love to hear if you’ve found a good way to eat grains and dairy in moderation!